Inevitably, with any round-robin, group-stage format, some matches end up being dubbed as 'dead rubbers'. But it is almost unheard of for a group stage game to take place after the knock-out stages have started. That is the scenario facing London Bees and Watford on Sunday. The two play a rearranged Continental Cup match - originally postponed because of a waterlogged pitch - a week after the quarter-finals, for which they failed to qualify, took place. However, both clubs insist there is plenty to play for in the game. "It's probably a local derby. 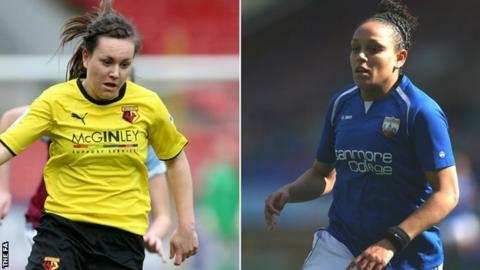 It is a rivalry game and we'll approach it like any other rivalry game," Watford captain Emily Heaslip told BBC Sport. West Bromwich Albion 5-5 Manchester United - on the final day of the 2012-13 Premier League season, Sir Alex Ferguson's final game in charge. "Nothing has gone our way this season. We want a reason to be proud of ourselves. "The last game we played was against them. We lost 4-0 and it was a bit of a shock. "We'll be trying desperately to prove a point. We need to show team spirit and a little bit of fight, that we didn't have last time." Both sides have lost all their matches in the competition so far, so neither can finish higher than fifth in Group One. "We don't want to finish bottom of the group," London Bees boss Julian Broomes added. "We really want the three points, to finish above Watford." London Bees are yet to win a match in the Continental Cup's history. They have avoided defeat once in the competition, with a 0-0 draw at Home to Millwall in the Group stage last season. The Bees, who finished bottom of the Women's Super League Two last season with just eight points from 18 games, have 12 points from 15 matches so far this term. "We have improved immensely this season," Broomes added. "We've trained against the Academy boys sometimes, to get the girls used to a high tempo. "We've drawn against Yeovil and Everton, and we were unlucky against Oxford. We're showing that we're a good team and I want the girls to continue that on Sunday." Birmingham City, Liverpool and Notts County are already through to the semi-finals of the Continental Cup, while Arsenal and Manchester City's quarter-final was postponed after City, the 2014 winners, were charged with fielding an ineligible player in an earlier match.